April 7th is Arbor Day 2017 in Kentucky! 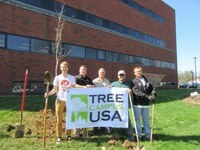 Come help us restore Louisville's shrinking tree canopy. Join us for a celebration of UofL’s on-going commitment to trees and our status as a Tree Campus USA(for 7 years running!). At noon, you can help us plant a tree outside of Louisville Hall! Take home a free native tree sapling to plant in your yard or neighborhood! We'll be giving away 100 Eastern Redbuds and 100 Roughleaf Dogwoods (provided by the Jefferson County Soil & Water Conservation District). Come on out and enjoy music played on wooden instruments! Co-sponsored by UofL's Sustainability Council, Campus Housing, UofL Dining, Office of Health Promotion, and the Jefferson County Soil and Water Conservation District.